Product #21347 | SKU H-H020AE-K | 0.0 (no ratings yet) Thanks for your rating! 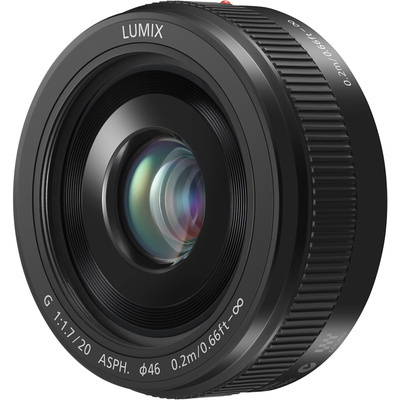 Characterised by its slender profile, the black Lumix G 20mm f/1.7 II ASPH. from Panasonic is a compact, slightly wide 40mm equivalent prime for Micro Four Thirds mirrorless cameras. Its bright f/1.7 maximum aperture offers notable control focus for working with shallow depth of field techniques and also benefits working in difficult lighting conditions. The optical design incorporates a pair of aspherical elements to suppress spherical aberrations and distortion for high sharpness and accurate rendering, and individual elements have also been multi-coated to control surface reflections and flare for improved contrast in strong lighting conditions. Two aspherical elements are used to reduce spherical aberrations and distortion in order to realise greater sharpness and resolution. Pancake form factor measures just 2.54 cm-thick, making it ideal for everyday and travel use.